I’m Christine – BSc in Global Nutrition and Health, plant gal, cookbook author, self-taught photographer, movement enthusiast and lover of everything natural, organic and yummy (and I’m not just talking about food here). 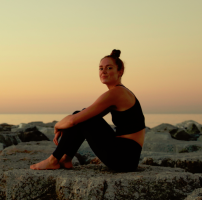 I currently live in the capital of Denmark, a busy city with lots of people and lots of noise, where I do my best to stay connected with nature – not only physically but also internally. Being connected to nature shines through in everything I do – from cooking to coaching to moving. I want to inspire you to do something good for yourself. Today and for the rest of your life. You deserve it! Want to connect? Find me on my blog, Instagram or Facebook.